Thank you for reading this year’s Outlook. As ever, it is our hope that the ideas and challenges here will inspire you to take some form of positive action. By gaining an understanding of global issues and then confronting them together, we can move towards a better world. If you would like to know more about the data contained in this report, please visit our methodology website at wef.ch/o15m or contact the Global Agenda Council Team via [email protected]. The Outlook on the Global Agenda sets out to illuminate the biggest trends that the world will face over the coming 12 to 18 months. 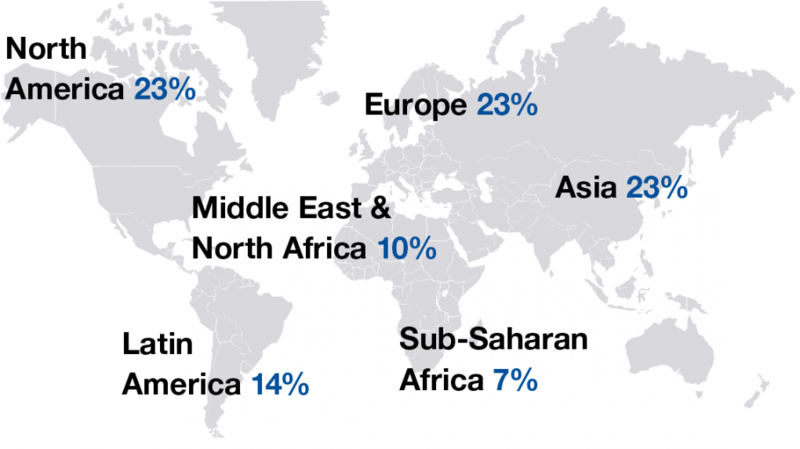 Every year the World Economic Forum taps into its global knowledge network, using its Survey on the Global Agenda to cast a spotlight on the opportunities and problems that lie just over the horizon. A key objective was to make this year’s Outlook more comprehensive than ever before. While we retained our chapters on global trends, regional challenges and emerging issues, efforts were also taken to overhaul each section, providing increased levels of insight into specific concerns on different parts of the globe. A new set of questions, around leadership, were one of most notable additions to our Survey; the responses to these ultimately formed the basis of our Global Leadership Index. Our global trends are again compiled using a Delphi Method, whereby a team of experts undergo several rounds of structured, anonymous questioning. This expert panel is made up of professionals and thought leaders who serve on the Global Agenda Councils, in addition to Young Global Leaders (aged 40 or under) and Global Shapers (aged 30 or below). By the end of the process, this group had collectively produced the initial shortlist of trends to appear within this year’s Survey. These were then ranked by our respondents, producing the list of top 10 global trends you find in the report. The Survey on the Global Agenda was distributed in June and July to members and alumni of the Global Agenda Councils, as well as Young Global Leaders and Global Shapers. A total of 1,767 responses were received this year. Our Survey was answered by at least 120 people in each of the world’s major regions – Asia; Europe; North America; Latin America; Middle East and North Africa; and Sub-Saharan Africa. The welcome granularity of our results afforded us a wide perspective on how views and concerns differ according to geographical region, among other variables such as age and gender. The results of our Survey are comprised of quantitative and qualitative data. The latter are obtained via responses to five open-field questions in our questionnaire, which offer respondents the chance to delve deeper into the topic by offering their opinion on effective solutions. All of our text-based answers are scrutinized and processed by an expert in qualitative analysis, facilitating their use within this report. The quantitative data can be ranked by various criteria – including the country, region, and age of respondent – to highlight specific trends and findings. When our two data sets are finally combined, they present a detailed picture of the world issues that are of greatest concern to our Survey community. The Outlook would not be possible without with the help and invaluable input of a great many people, particularly the members of our Global Agenda Councils. Thanks are due to Seth Rosenthal, who helped to design this year’s Survey and assisted with our data questions, and to Diane Purvin, who provided essential analysis of our qualitative data. The Pew Research Center once again played a key role in the production the Outlook, granting us advanced access to the findings of its Global Attitudes Project. Pew’s experts also helped to shape our Survey questions, and advised us on the sourcing of additional information to compliment our core data. The regional figures of the Pew data presented were calculated using medians of country responses. The number of countries per region varies across each data point. Further thanks go to Mona Hammami, who provided open-source data for our stories, and to the Oxford University’s Saïd Business School and Blavatnik School of Government, whose team of students also supported this project. Finally, we worked with creative agency Human After All on the design and publication of this report. They helped us conduct all of the interviews on which the pieces in the Outlook are based.